The size of your wrists is determined largely by genetics, as the area is composed mostly of bone rather than muscle. Wrist circumference often is used to gauge your body's frame and bone size. For a man over 5 feet 5 inches, wrist circumference of 5.5 to 6.5 inches is small, 6.5 to 7.5 inches is medium and over 7.5 inches is large. For a woman between the height of 5 feet 2 inches and 5 feet 5 inches, wrist circumference of 6 inches or less is small, 6 to 6.25 is medium and over 6.25 is large. You typically can add approximately 1/16 to 1/2 inch to your wrists. Simultaneously, you add a significant amount of muscle to your forearms, making your wrists appear larger. This provides better stability for heavy lifting, bodybuilding and fighting styles such as boxing. You need a pair of dumbbells or a light barbell to perform wrist curls. Sit on a chair or bench slightly lower than knee height, with your legs together, so your thighs angle up. Hold a dumbbell in each hand or a barbell evenly between both hands and lean forward to rest your elbows and forearms on your thighs. Your wrists should hang off your knees, palms facing out. Extend your wrists down, straightening your fingers slightly without dropping the weight. Flex your wrists and pull the dumbbells or barbells toward you until completely curled, clenching your hands into fists. Hold this position for a second before extending your wrists back down to conclude one repetition. You can reverse your hands so your palms face down for a reversed wrist curl. To perform wrist rolls, you need a light pair of dumbbells. Sit on a chair and rest your elbows and forearms on your thighs, holding a dumbbell in each hand, palms facing up. Roll your wrists in slow, controlled circles to the right for approximately 10 seconds then switch the circles to the left for 10 seconds. This concludes one repetition. You need a pair of dumbbells for the wrist hammer. Sit on a chair and rest your forearms and elbows on your thighs with a dumbbell in each hand, palms facing each other. Lift both weights toward the ceiling and then lower them in a slow hammering motion. This completes one repetition of the wrist hammer. Your palms should remain facing each other the entire time. Jar or weight gripping requires weighted jars, also known as gripping jars or nigiri game jars, or a pair of dumbbells. Place a gripping jar or dumbbell on either side of you while standing. 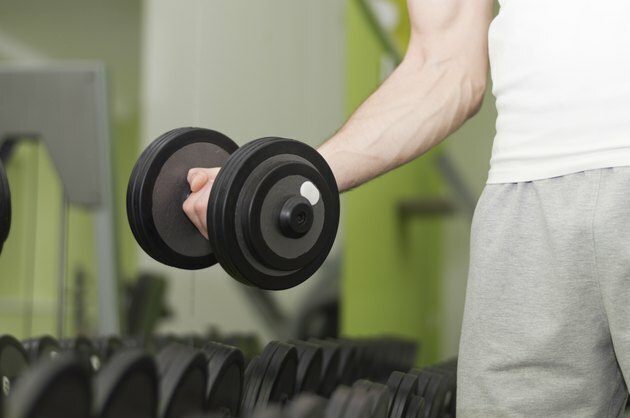 If you are using dumbbells, place them upright so you can grip their plates. Bend at the knees and lower your hands to grip each jar or dumbbell with your fingertips. Stand up, holding the jars or dumbbells tightly. To intensify the exercise, slowly walk while gripping the jars or dumbbells or twist them in a controlled motion. Always consult your physician before beginning a wrist-training routine to ensure your joints can withstand it. Ask your physician for advice about how heavy your weights should be and how many repetitions you should perform. In the case of jar or weight gripping, ask how long you should hold the weights. If you feel pain during your workout, stop and consult a health care professional.